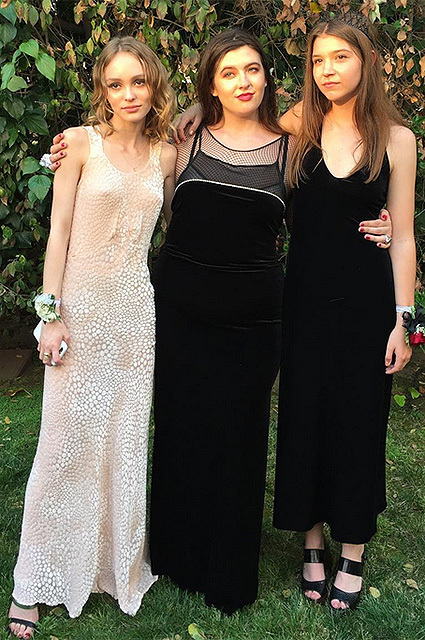 The daughter of Johnny Depp (52) and Vanessa Paradis (43) Lily-Rose (17) was seen at prom and once again scared with her unhealthy thinness. It opens the way for comment on the fact that she suffers from anorexia. With the growth of 1.6 meters Lily-Rose weighs about 40 kilograms and continues to literally melt off. She went to prom in a modest yet daring outfit, stressing her thinness. Lily-Rose, who recently became the face of Chanel, picked translucent flesh-colored dress without a bra. Director Kevin Smith released Photo of Lily-Rose Depp on his Instagram. 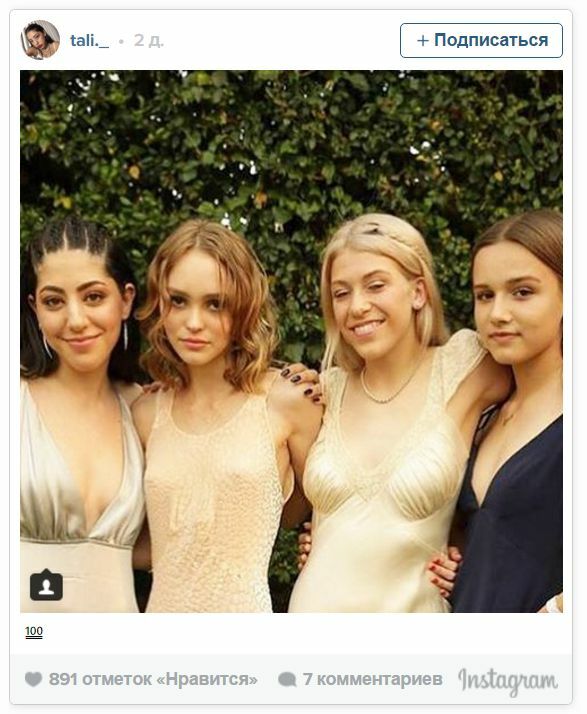 In the photo she poses with a classmate and colleague, Harley Quinn Smith (16): girlfriend recently starred in "Yoga Hosers", directed by Harley’s father. Lily’s fans pointed out in comments that she is too thin, and advised her to eat a cheeseburger as soon as possible. But Lily-Rose is perfectly relaxed about her weight. Classmates have delivered more photographs of Lily. They are quite enough to see the holiday outfits of the girls. Almost all young graduates were looking the same in the evening light pearl dresses which resebled camisoles.. The classic black and dark blue outfits have become the only alternative. And no full skirts and hair-cakes! Straight cut dresses, flowing hair, stable heels and small clutches. Lily-Rose has inherited from the mother Vanessa Paradis not only an unusual appearance, but the taste and style. For important evening 17-year-old actress chose a long peach dress and minimalist jewelry - just a thin chain and a flower bracelet on hand. Lily herself, by the way, did not upload a photo with a holiday on the Instagram, which is not surprising. As we remember, she does not like the social networks and would have preferred them did not exist. However, a public statement in defense of her father - Johnny Depp, who was accused of domestic violence by his wife Amber Heard - she made through social networks. At school Lily-Rose was popular not only because of stellar parents (who will be surprised by this in Los Angeles?). It is known that she had a great relationship with teachers and peers who speak of her as a "bright, cheerful and kind person" and say that she has good, but "a bit grim" humor. At school, Lily was an excellent student and, of course, engaged in creative work - singing and dancing. More recently, the paparazzi caught her walking with her boyfriend, 24-year-old male model Ash Stymest. Lily-Rose looked happy and smiled a lot, but even her fairly slim boyfriend made Lily look unnaturally thin.